Mobile search has officially trumped desktop search - more people are using Google from their smartphones and tablets to find information than from their desktop or laptop PCs. That’s definitely a shift, but does it matter to business owner and decision makers? Yes, it does. Moreover, it matters a great deal. 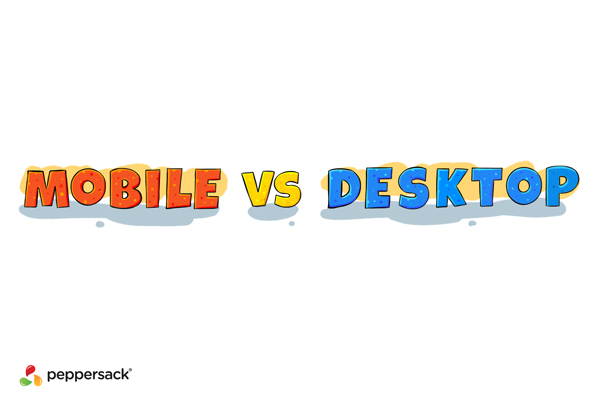 The rise of mobile means that you need to ensure you’re optimising for users searching from those devices and in many instances, that requires comparing very different search terminology. There’s a lot of crossover between mobile and desktop users in the terms they use to search Google for information, products and services. Some are very obviously different. For instance, a mobile user might run a search for “Flower delivery in London”, while a desktop user might prefer a broader term so that he or she could compare different companies side by side in the search results. However, many of the search terms used are actually the same, but with a different intent behind the search. Primarily, mobile searchers are looking for information about how to contact a company or where a business is located. They also frequently look for information about nutrition while dining in restaurants, about mobile coupons while inside the store itself and other activities that don’t apply to desktop searchers. There’s an immediacy to mobile search that isn’t present with desktop searches. Obviously, you need to create content that is directed specifically at mobile users. To do that, you need to know what terms they’re searching for that lead to your website. Thankfully, Google Analytics provides this information (at least to an extent). When you open GA, you can click on Audience, and then on Mobile. Here, you’ll have information about the search terms, sources and other information pertaining to mobile. However, don’t stop there. Click on Overview and you’ll find even more information. Under this tab, you’ll be presented with information about all your traffic sources segmented by desktop, tablet and mobile. There’s even a helpful pie chart that helps you visualise the percentage of visitors stemming from each type of device. Based on this, you can determine several things, including whether or not you need to do some work to increase visits from mobile users (this is particularly important if you’re a local business hoping to capitalise on traffic in your immediate area, as opposed to a company with a national or international focus). Other important information that can be gleaned here includes the average visit duration, the ecommerce conversion rate (if applicable), amount of revenue per source, and even the type of mobile devices used by your visitors. Click the customisation option and you’re able to delve even further into your traffic for mobile users. Based on this data, you can begin to make smart decisions regarding your marketing strategy. If you need help, Peppersack can provide essential analysis and marketing solutions to build your brand and market share with mobile searchers. We will not use your email address for any purpose other than to send you our White Paper. You can unsubscribe at any time. Peppersack Limited, Atlantic Business Centre, Atlantic Street, Altrincham, Manchester, WA14 5NQ, UK. Copyright 2016 Peppersack. All rights reserved.